Introducing a la modes from My Favorite Things! Well, SURPRISE! Since this month marks the 4th birthday of My Favorite Things, Kim the owner, wanted to continue celebrating this month with something a little new and different. Introducing a la modes from MFT!! This one is called Picture Perfect. This particular set comes with the oh-so-trendy (and cute!) girl and 3 sentiment stamps. Picture Perfect and one other a la mode set will be available tomorrow night, July 14th after our a la mode blog hop! Be sure and check out Kim's blog for a list of all the DT members who are previewing this set. Then check it again on the 14th for the other a la mode set peeking tomorrow, Birthday Girl. --a la modes will be available only in rubber. --Each set is produced in the USA using the higest quality rubber, with the deepest etch possible. --Each image and sentiment is backed on cling foam and scroll cut, making it ready for stamping right out of the bag! --Packaged in a clear hang bag, we've also provided the ideal storage solution by including a thick laminated header card in each set that can be used to store the stamp set, in its entirety after purchase. --only $10.95 for the 3 x 4" set. SUSIE Q-TIP: After I cut my little felt flower using the Rolled Flower Die-namic die and put it together, I topped it off with a few little Glitter Garnishes from MFT as well. I've had these for quite a while, and they had gone by the wayside (because of my love of buttons). I never think to use them. With the rise in popularity of paper/felt/fabric flowers, these are the perfect little touch for the centers. Hello again little sparkly friends. I am going to have to get some of those glittered garnishes! They are totally awesome! P.S. Jen and I are going to be getting together for a crochet how to.. you want to join us???? Gorgeous card! What a great image! Love the flower with the sparklies, so pretty! LOVE the garnished center Sus! Susan, this is fabulous!! The colors just make me smile, and I love the felt flower! Good to "see" you -- hope you are doing well! I just LOVE this Sue!!! Darling Susan. Love the pretty colors and that great flower. just LOVE it! that felt flower is awesome! SUPER-D-DUPER cute, Susan! I love the colors and rolled flower! Love it Susan! The warm, sunny colors are so you! Cuteness! Love the fun colors you used on this! Super cute!! 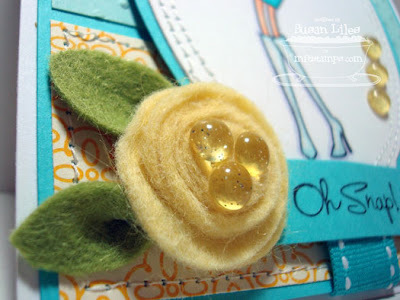 Love your layout and embellishments! !